“I think it’s really impactful for Scouts to learn what it’s like to be disabled, if only for a few minutes, and to have a better appreciation for those who are less fortunate,” says J.W. “Bill” Marriott Jr., Stephen’s father. Stephen Marriott died in 2013 from complications of mitochondrial disease. The rare muscle disorder gradually cost him his eyesight, hearing and strength before taking his life at age 54. Because of the effects of the disease, Stephen began having difficulty seeing and hearing as a boy. He wore hearing aids in high school. As a graduate school student, he struggled to read the blackboard in his business classes. Eventually, he lost all his sight. Muscle disorders caused by the ailment, meanwhile, prevented him from using Braille. But Stephen accepted his difficulties and never shrank from life’s challenges. After earning his Eagle rank, he completed a two-year church mission. Returning to school, he earned a bachelor’s degree from Brigham Young University. Later he received a master’s of business administration from Arizona State University. Stephen was active in his community, including as an adult Scouter who served at the unit and council levels. He also was a board member or otherwise involved with a number of organizations dedicated to helping people with disabilities. They include the American Foundation for the Blind, the American Speech–Language–Hearing Association, and the National Institute on Deafness and Other Communication Disorders. Along with these activities, Stephen had a successful career in the family business, Marriott International, started by his grandfather. As his illness made it increasingly difficult for him to see, Stephen began using a voice-activated computer. He used a wheelchair to get around and had a guide to assist him when he visited Marriott’s properties. Even as his struggles with the illness increased, Stephen endeavored to go to work every day, his father says. Stephen was not shy about putting himself in the public eye. He was an energetic advocate for the disabled, as well as a longtime sales trainer. He gave many speeches, which in later years he memorized. 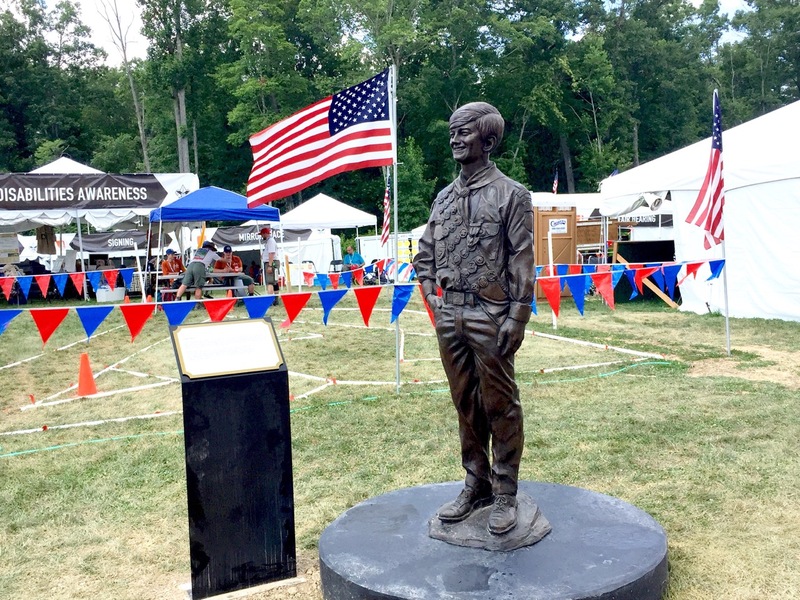 Stephen Marriott’s statue celebrates his advocacy and passion for disabilities awareness. 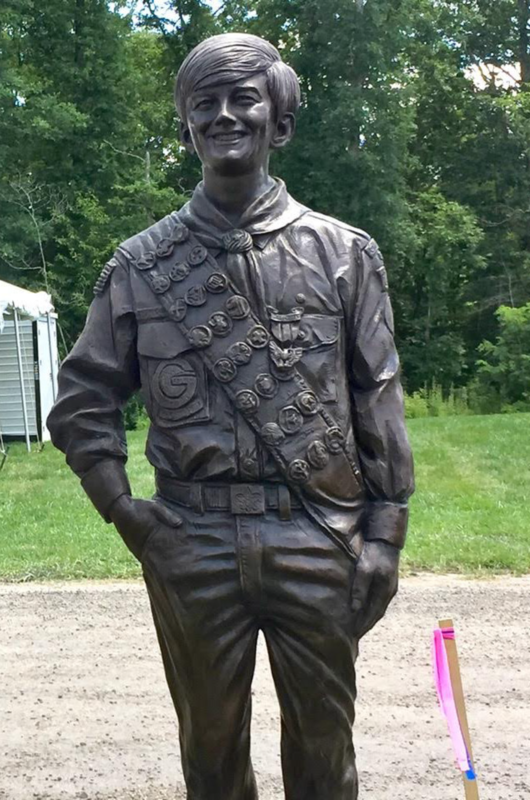 His passion, plus the support of his family and other Scouting philanthropists, will establish a permanent disAbilities Awareness presence at the Summit. 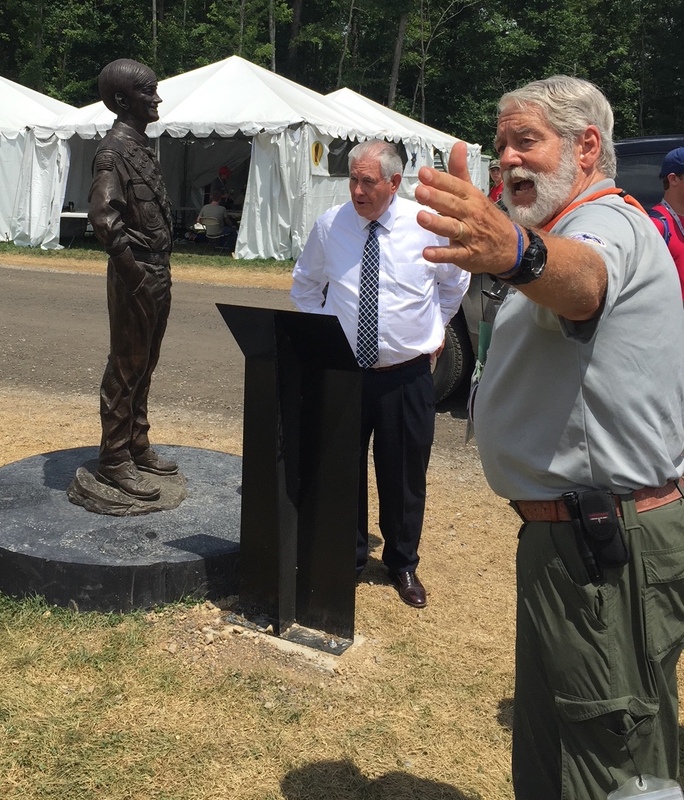 The photo above shows former BSA National President and US Secretary of State Rex Tillerson (center) reading the inscription on the statue honoring Stephen G. Marriott (left). On the right is Tony Mei, Chair of the Jamboree’s disAbilities Awareness Challenge, and of the BSA’s National Disabilities Awareness Task Force.